The Dread Ringer crew is happy to announce that today we’re launching the Dark Seas ship! We’ve battened down the hatches and are sailin’ out of Early Access on Steam. This doesn't mean we're done developin’ the ocean or makin’ improvements, far from it. It just means that we're ready to welcome new mates aboard. Join us by takin’ a station and puzzlin’ yer way to glory. Ye can find the game on Steam here. One of our largest projects during Early Access was moving our servers (including the standard oceans) to something newer and more stable. This process was quite extensive, but is now complete. Huzzah! We’ve also made a large number of changes over these past months which including the new War Galleon ship type, higher swabbie counts for pillaging, changes to island ownership, and rewards for PvP. You can review the full list here. Many of these changes were a direct result of your helpful feedback. In celebration of our Full Release Launch we’re going to have a series of blue grey tournaments and competitions. The festivities will culminate in the opening the first large island for blockade on July 14th. We suggest ye start recruitin' mates and makin' plans in Parley. We’re introducing a new DLC package to help celebrate our launch. 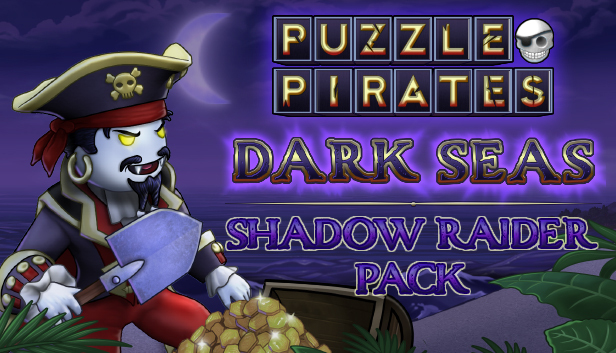 With the Shadow Raider Pack, ye’ll pillage exclusive items to help gain a nocturnal advantage while explorin’ the Dark Seas. 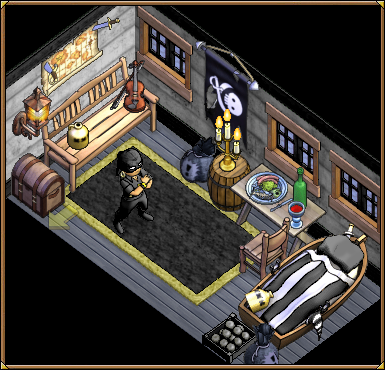 This special pack contains exclusive items suitable for any pirate lookin’ fer a fightin’ edge. - Shadow War Galleon. A special limited edition War Galleon ship with a Shadow theme. - Permanent Shovel bludgeon. This bludgeon comes in random colors and is exclusive to this DLC. It will never dust. - Permanent Rogue Hat. This black hat is exclusive to this DLC and will never dust. The bandana will be selected at random between gold, red, maroon, white, or blue. - Black Vampire Raiment coat. The secondary color will match the color of the bandana on the Rogue Hat. - 30 day Parlor Badge. Play cards and carousing puzzles at yer local inn. - 10 Rogue Marks. Rename yer ship using Rogue Marks. - 3 Shadow Chromas and 3 Crimson Chromas. These allow you to dye one of the colors on a piece of clothing. - 1 sanguine amulet. Temporarily turn your pirate into a vampire! As with all DLC, items can only be accepted by one Pirate on the account, so choose wisely matey. Permanent hats and Shovel Bludgeons will bind to the pirate that accepts the items. A hearty thanks for everyone who has sailed the Early Access seas and provided feedback. We’ve made a lot of changes based off of that feedback and hope to continue to do so in the future. So today we raise a mug o' rum to all ye fine mates who've stuck with us through the years! Greedy brigands 'n barbarians who 'ave selfishly hoarded bits o' booty fer themselves 'ave infiltrated the oceans. Ye might spy some durin' the melee phase o' sea battle while out on a pillage. Ye’ll recognize the blaggards by thar extravagant jewelry they can’t resist showin' off, such as gold eyepatches 'n flashy necklaces. They 'ave one fatal flaw: each greedy brigand 'n barbarian has a weakness against one color. Target thar weakness 'n plunder some o' thar Lavish Lockers filled wit' Pieces of Eight, along with exclusive new items, silver chromas, and rare creatures to call yer own. If yer a collector (and what good pirate isn't! ), ye'll likely have a grand collection of furniture gatherin' dust in yer booty. If yer one to want to show off yer imposing assemblage, be sure to visit yer local island to find the Gallery! This expansive new house features large rooms with voluminous wall space, and a floorplan to showcase yer most complex arrangement of goods. Host a Gallery Exhibit! 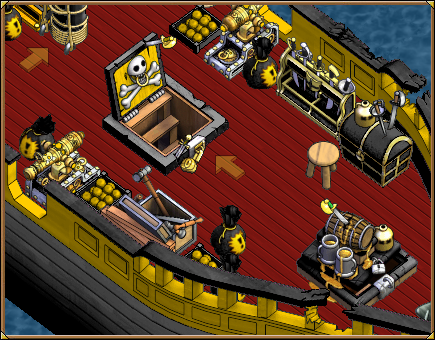 A whisk to yer Gallery will appear on the notice board for a week, and allow pirates to browse yer fine display. 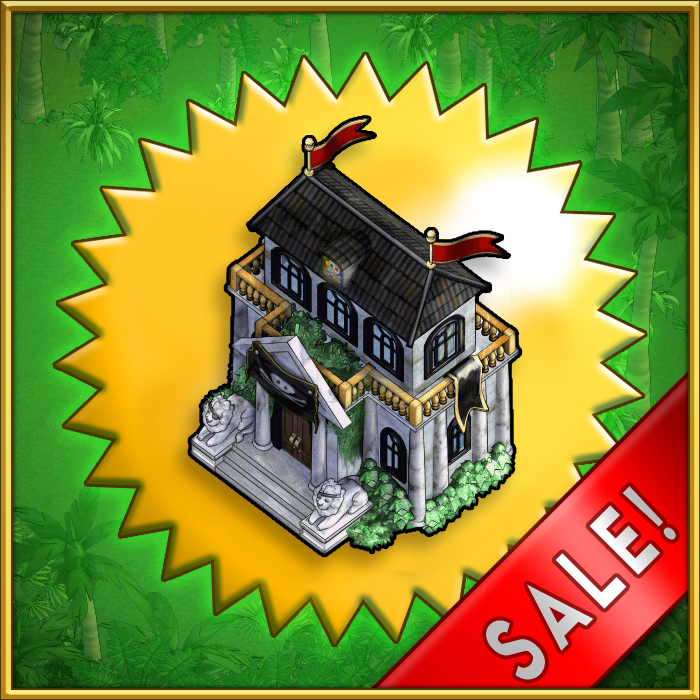 To celebrate the release of the Gallery, we're havin' a sale on select sizes of pirate housing! This applies to both the cost in pieces of eight as well as the doubloon fee on doubloon oceans. If yer plannin' to upgrade yer residence, or just lookin' to add a summer getaway, act fast! All housing prices will return to normal at 3 PM, August 10, 2015. UPDATE: Due to high demand, the sale price for the gallery will be extended to 3PM August 24, 2015! For months, merchants from the Empire have reported an unusual number of ships missing or destroyed in previously quiet waters. Those lucky to survive the attacks report “Giant Snakes” emerging from the sea. The Brotherhood of Applied Cryptozoology has confirmed these were kraken attacks! This legendary sea monster was once only a whispered rumor - the mysterious source for Kraken’s Blood. 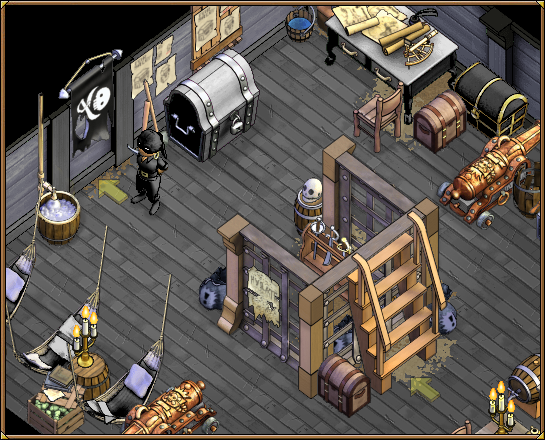 Now, talk is swirling around pirate inns, claiming there are vast treasures to be found in the kraken’s lair. A new mysterious material, Kraken’s Ink, has been discovered. 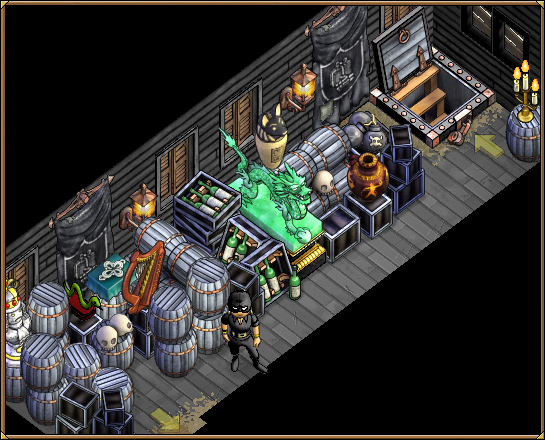 A local alchemist was seen purchasing large amounts of the material to transform it into Kraken’s Blood! Be warned! 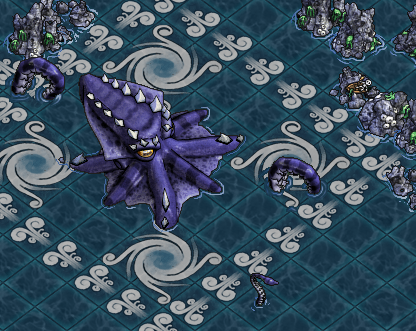 Large ships cannot approach the kraken, as the beast will quickly send them to Davy Jones’ Locker. Ships traveling to a Kraken’s Lair should stock one lifeboat for each pirate aboard. Ye can find this commodity at yer local shipyard. This will allow the crew to approach the kraken in small, maneuverable rowboats. Avoid the tentacles and collect treasure! Krazy Karen’s Kraken Kraze Klearance! Kustomize yer rowboat on yer next Kraken Konfrontation! *Rowboat Kits last 15 login days. Kraken’s Lairs is a new Sea Monster Hunt. If yer on a Doubloon Ocean, ye will need a bravery badge. Pirates on Cerulean will need a subscription to participate. Report for Duty - Testing on Ice Ocean! Maties! Starting November 14th, we will be looking for your feedback on the game’s new user interface. 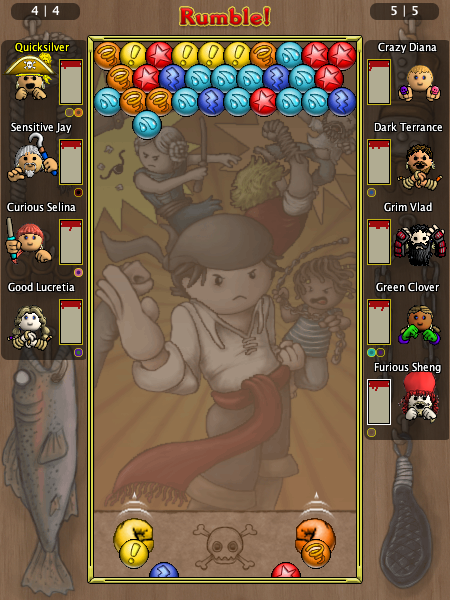 Tablet users of Puzzle Pirates will recognize this UI. The developers have been working hard to bring the new UI to the desktop version of the game. To access this alpha phase of testing, you will need to download and install a special Ice Ocean client to your computer. A link to the client download and further information about this testing can be found here. Please note that during this phase of testing, access is restricted to current subscribers or players who have purchased at least 24 doubloons in the last 30 days. Please post feedback in the Ice Discussion section of the forums. 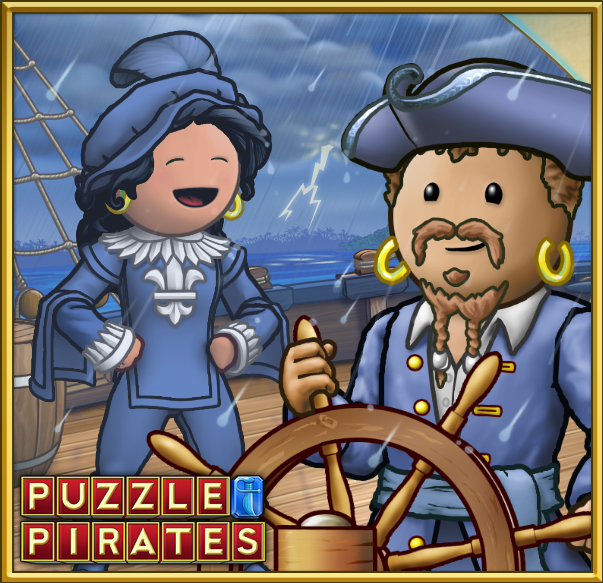 Be sure to check the "Puzzle Pirates X" sticky at the top for feedback guidelines. This is an alpha test for the new UI, meaning it is still in early development and further changes will be made. The developers want to hear your feedback and observations of the new UI and its performance. Once you've spent some time with the new UI, please fill out our feedback survey before November 21. Avast ye scallywags! 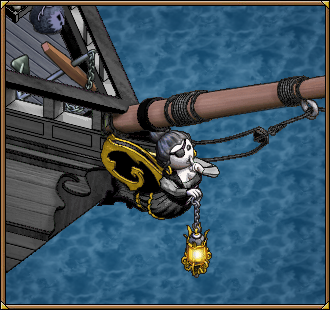 If ye find yerself always under the heel of the Imperial authority when yer evening becomes too boisterous, this month’s Limited Edition ship is perfect for any rowdy freedom-loving pirate. Swagger over to yer local shipyard, and let’s get this parrrrty started! 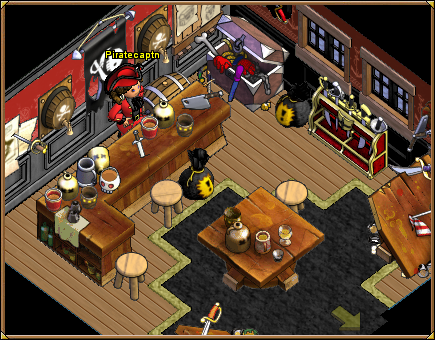 The Roister Class Sloop will let ye and yer hearties carouse the night away! 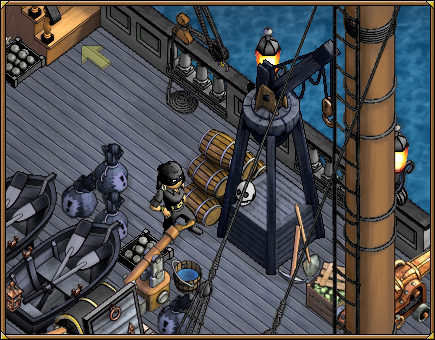 Even while manning a station, yer pirate won’t be far from the rum keg. The captain’s cabin has private reserve rum taps to ensure the rum is never gone* as ye chart a course for good times. The captain also has access to a private reserve of swords and knives thoughtfully pinned across the walls and tables. Watch where ye lean! 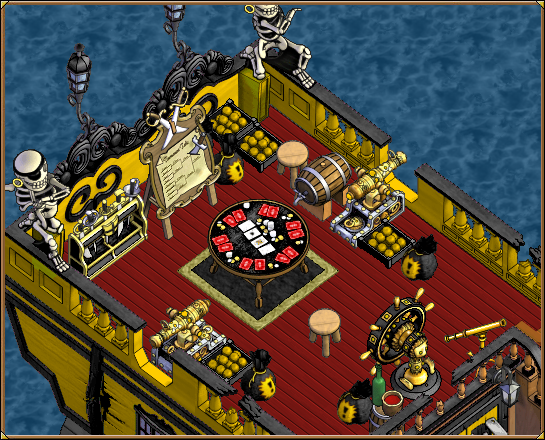 For pirates who enjoy a good wager, roulette and craps tables are below deck, with easy access to food and drink. And, if the captain needs a few scurvy dogs to man the bilge pump or swing a hammer, duty stations are within easy reach. This ship is built for “multitasking”--the navigator will find everything close at hand (or hook) for an uproarious, fun pillage – cards, beverages, and for those quick maneuvers to avoid crashing into the rocks, a golden helm. A party everyone will talk about for years to come – if they remember what happened! With a sword in one hand and a mug in the other, what could go wrong? The Roister Class Sloop will only be available in Shipyards through October 15, 2013. *Unless ye forget to stock the ship before leaving port. Then you’ll have a mutiny to deal with, which can be as tumultuous as a good parrrrty. 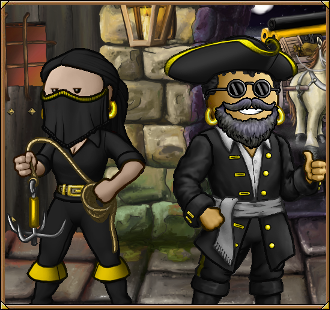 For a limited time, pirates may have their portraits painted with backgrounds that feature secretive Black Market locations. Additionally, all Black Box trinkets may now be held in portraits! Accomplished artists from the Puzzle Pirates community have made available a series of limited edition portrait backgrounds themed around the infamous Black Markets. Visit a portrait easel between now and November 1st to browse these limited edition backgrounds! Proprietors of the Black Market have deemed pictorial representations of all twenty-five Black Box trinkets to be acceptable. Ye may now show off yer collection of Black Box trinkets without worry of repercussions from those shadowy agents! The Lady of Secrets is Back in Black! 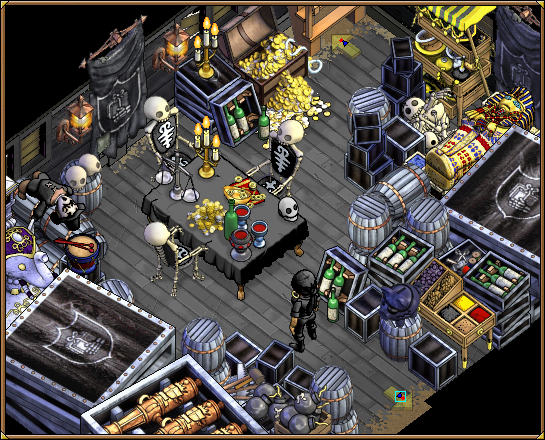 Those mysterious members of the Smuggler's Guild, purveyors of prohibited property and paraphernalia, have toiled in the shadows to create a new class of vessel meant to haul bulk shipments of black market goods across the trade lanes. For clandestine reasons that cannot be uttered, they've made the plans to these new ships available to loyal shipwrights everywhere. Visit your local shipyard and see if they have the new Smuggler Class War Brig in stock! Like its smaller sister ships, the Smuggler Class War Brig variant also bears the revered Lady of Secrets as its figurehead. She serves as a reminder that revealing secrets can have dreadful consequences. These sturdy cranes speedily lift cargo to and from secret compartments, leaving the deck clear of any contraband or other goods that may bring an invasive search by Imperial watchdogs. 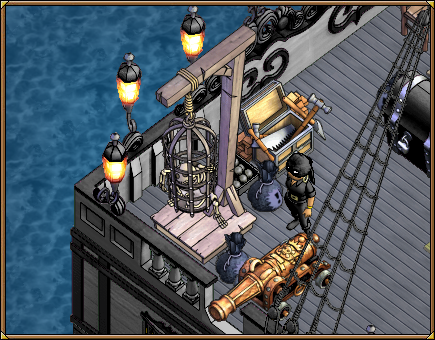 Hanging a gibbet on the deck signifies that you obey time-honored maritime law and follow a strict code of ethics that would never, ever allow the smuggling of criminal items on your ship. 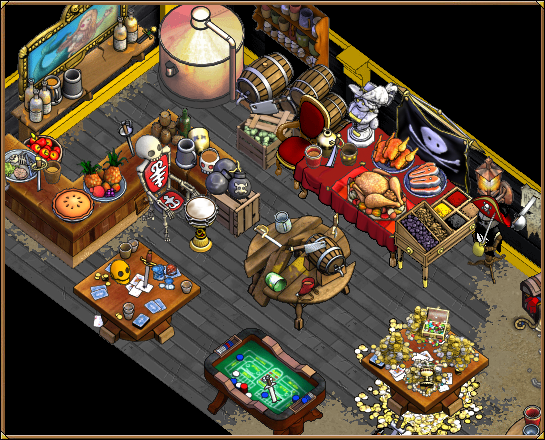 This humble and thoroughly lawful captain's cabin is a strategic place to invite local or Imperial customs officers for a drink of your best rum before you happily submit to a surprise search. Though the central cabin would pass most general inspections, a closer look will reveal telltale marks of the vessel's shadowy intent! There are two doors visible to the naked eye, but the shipwrights have seen the original blueprints, and those show a third egress attached to the nearby lantern through an elaborate system of pulleys! That passage leads to an ample crawlspace for storing barrels, bags, and boxes of everything you don't want unwelcome guests getting their hands on. A hatch in the corner leads further into the hidden innards of the ship. Behold the main smuggling hold! This is the decisive space for carrying your hoard of black-market goods past Johnny Imperial and his agent overseers! Tongues have been wagging about the impregnable nature of this hiding space; it is said no true Imperial officer has so much as set his or her eyes on this shadowy sanctuary! And as fast as you can knock three times on the seal of the Smuggler's Guild, yet another hidden door leads to the main galley, with stairs back up to the top deck. It's a little dusty in here, but spotlessly clean in the eyes of the law. First, that no Imperial or lawful agent should be allowed to know of its secrets. Second, that these ships shall be sold with a 20% discount on delivery fees. 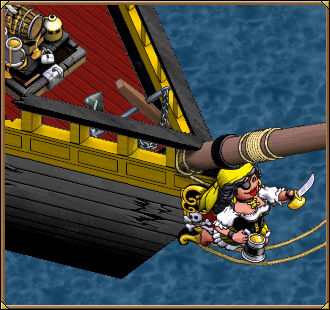 The Smuggler Class War Brig will be available throughout the month of April with a delivery fee of only 80 Doubloons on Doubloon oceans! That means a 20% discount over standard delivery fees for Limited Edition War Brigs, or a savings of 20 doubloons for each of these ships sold. So, make sure you aren't being followed and stop in at a local shipyard to acquire one of these beauties today! Avast! 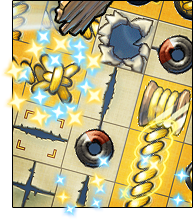 A new puzzle has washed ashore: Sail Patching! 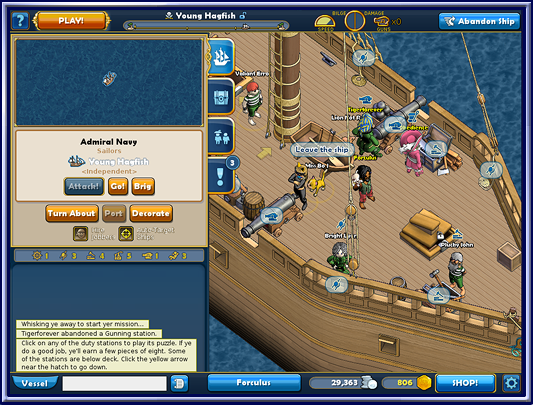 Patching allows pirates to repair damage done to their ship by stitching up tears in the sails. Stitch as much as you can for a high score, but watch out for wind gusts! You can read more about this exciting new addition over here, and when you're ready, Patching is accessible from the Carpentry box aboard any ship, so go check it out! If you're looking for a good way to celebrate Patching's release, what better way than with a new portrait? We just released a slew of new player-created backgrounds to choose from, as well as a bunch of new eyes and mouths to pose with! Feeling sly, or scared, or a little embarrassed? Now there's a portrait for that! We also slipped a few more little things into this release, such as a cool new mask inside the Black Box. You can read the full details over here. We'll see you on the high seas! Barnabas and the Haunted Seas await! First, there were riddles. Then, a trip to the Ice Ocean. 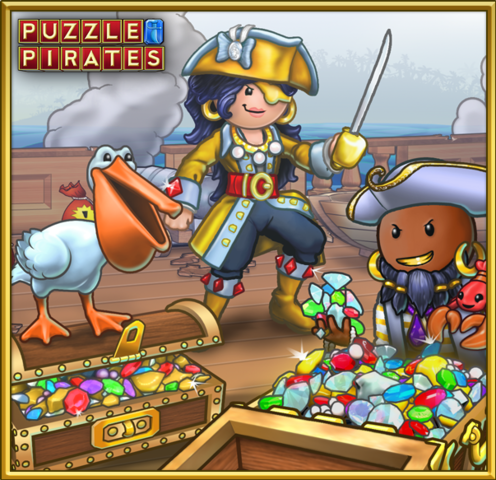 Now, it's finally here: the Haunted Seas have arrived in Puzzle Pirates' August Update! 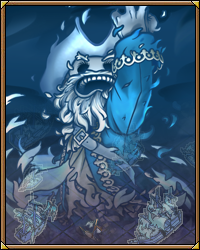 The newest Sea Monster Lair to make its appearance in Puzzle Pirates, the Haunted Seas are the dire domain of the much-feared Brigand King Barnabas the Pale. Featuring ghostly opponents, a new twist on the Swordfighting puzzle and plenty of opportunities to Treasure Haul, the Haunted Seas hold all kinds of excitement and treasure for an adventurous pirate: if you can best Barnabas's minions, that is! The rewards, however, are certainly worth the trouble. 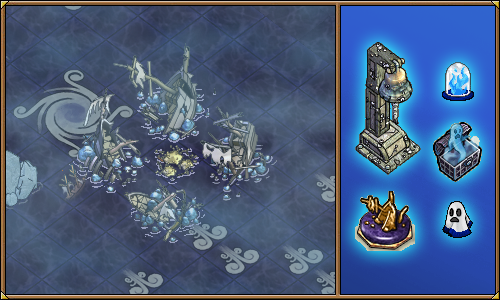 If your vessel can survive the onslaught of ghostly ships long enough to reach and defeat the protectors of one of the Haunted Seas' eerie ship graveyards, a number of juicy shipwrecks filled with haunted chests will be yours for the taking! 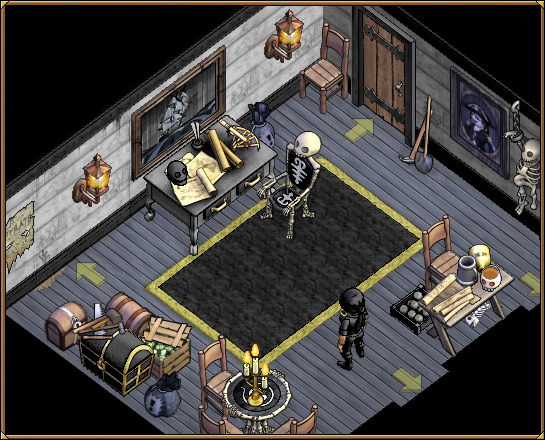 For more information, you can take a look at the official documentation about the Haunted Seas, but we really recommend just heading in-game, stealing a Haunted Seas map from some brigands and checking it out first hand! Renamed treasure chests in Atlantis! The development team will now be able to sleep at night, as the names for the Atlantean chests will now match up with those of the rest of the game (box, locker, chest). A new, darkened background on some of the areas on the swordfighting and rumble screens! 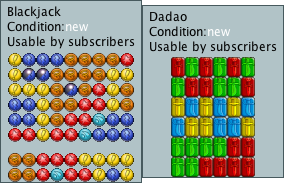 This is intended to improve visibility of things like # of pirates left in the fray. Remember what I just said about pictures? A change to the ordering of the Voyages table! Now, when you sort job offers by jobber cut, it'll take into account both the distribution (Jobber's Delight v. Even) AND the jobber cut so that Jobber's Delight no longer always gets sorted to the top! Huzzah! The full release notes can be found over here. We'll see you on the high seas! * Especially if some of those words are "the piece in the bottom row, second from the left, is a different color now... yeah, it's... no, your other left... no... yeah, the bottom row, that one".